This is not a role I expected or sought, but I felt compelled to go public when the U.S. Institute of Peace, in Washington, D.C., the taxpayer-funded organization to whose board President Bush appointed me, insisted on co-hosting an event with a group closely associated with radical Islam. That group is the Washington-based Center for the Study of Islam and Democracy; the event was a workshop that took place — over my strenuous objections — on March 19. Kamran Bokhari, formerly of Al-Muhajiroun, now welcome at the U.S. Institute of Peace. Most of CSID's Muslim personnel are radicals. I brought one such person in particular, Kamran Bokhari, to the attention of USIP's leadership. Mr. Bokhari is a fellow at CSID; as such, he is someone CSID's board of directors deems an expert "with high integrity and a good reputation." As a fellow, Mr. Bokhari may participate in the election of CSID's board of directors. He is, in short, integral to the CSID. Nor is Al-Muhajiroun's evil restricted to words and pictures. Its London-based leader, Omar bin Bakri Muhammad, has acknowledged recruiting jihadists to fight in such hotspots as Kashmir, Afghanistan, and Chechnya. At least one Al-Muhajiroun member went to Israel to engage in suicide terrorism. 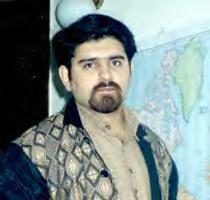 Al-Muhajiroun appears to be connected to one of the 9/11 hijackers, Hani Hanjour. USIP's indirect association with Al-Muhajiroun has many pernicious consequences. Perhaps the most consequential of these is the legitimacy USIP inadvertently confers on Mr. Bokhari and CSID, permitting radicals to pass themselves off as moderates. That legitimation follows an assumption that USIP carefully vetted CSID before working with it. But USIP did nothing of the sort. When its leadership insisted on working with CSID, it explained its reasons: "The CSID is assessed by relevant government organizations and credible NGOs supported by the Administration to be an appropriate organization for involvement in publicly funded projects organized by both the government and NGOs, including the Institute." Translated from bureaucratese, this says: "Others have worked with CSID, so why not us?" But such buck-passing means that in fact no one does due diligence — each organization relies on those that came before. Once in the door, a disreputable organization like CSID acquires a mainstream aura. Or it does until its true identity becomes clear. Over and over again, branches of the American government have been embarrassed by their blindness to jihadist Islam. Ask the presidential candidate who had himself photographed smiling side-by-side with an Islamist who soon after was imprisoned for terrorist activities. Ask the U.S. military, which has arrested or convicted at least seven Islamists for criminal activity connected to jihad. Ask the New York State prison system, which recently awoke up to the fact that one of its chaplains announced that God had inflicted 9/11 as punishment on the wicked — and the victims got what they deserved. Ask the mayor of Boston who had city land sold to the Islamic Society of Boston for less than 10% of market value, only to learn later that the organization is closely associated with one jihadi extremist banned from entering America, another sitting in federal prison, and a third who welcomes suicide bombings against Israelis as "glad tidings." In all these cases, no one was minding the store. The lesson is simple but burdensome: each governmental institution must do its own research. In the war on terror, it is not enough to deploy the police and the military; it is just as necessary to recognize and reject those who develop the ideas that eventually lead to violence. The American government needs to wake up to those elements in its midst whose allegiance in the war on terror is on the other side. Dr. Richard Solomon asked me to respond to your e-mail regarding the Institute's March 19 workshop on "Ijtihad: Reinterpreting Islamic Principles for the 21st Century," which we co-sponsored with the Center for Islam and Democracy (CSID). The purpose of the workshop was to provide an occasion for Muslim scholars committed to the reform of Islam and the advancement of a moderate Islamic agenda to address some of the most troublesome obstacles to adapting Islam for life in the 21st century, with implications for the status of women, the role of democracy in the Muslim world, and the nature of interfaith relations. The panelists, who are well established and highly regarded moderate Muslim scholars, presented very thoughtful and reformist positions. We invite you to view the event on our website at http://www.usip.org/events/2004/0319wksislam.html. The Institute was aware of and took seriously the accusations made against CSID and some of the speakers at the event. These allegations were investigated carefully with credible private individuals and U.S. government agencies and found to be without merit. The public criticism of CSID and the speakers was found to be based on quotes taken out of context, guilt by association, errors of fact, and innuendo. The speakers invited to the event have well-established records of promoting moderate Islamic perspectives, advocating democracy within the Muslim world, and opposing terrorism. One speaker, Dr. Muzammil Siddiqi, was invited by President Bush to lead a Muslim prayer at the Interfaith Prayer Service at the Washington National Cathedral after 9/11. He is also the leading Muslim participant in the Catholic/Muslim dialogue with the U.S. Conference of Catholic Bishops and has been very actively involved in other interfaith projects. CSID, which co-sponsored the event, is judged by senior officials at the State Department and the National Endowment for Democracy, who have spoken from CSID's platform, to be a moderate organization dedicated to promoting Islamic reform and the establishment of democracy in Muslim countries. It strongly opposes dictatorship everywhere in the Arab and Muslim worlds. With regard to the concern about Kamran Bokhari, this individual was not involved in the March 19 workshop in any way. He severed his ties to the al-Muhajiroun organization five years ago, prior to joining CSID, and has publicly denounced terrorism and political violence. The Institute, in accordance with its Congressional mandate, and as requested by the Administration, is focusing on the full range of issues associated with relations between the United States on the one hand, and the varied countries of the Muslim world on the other hand. Institute programming does not represent endorsement of particular views. Our events intentionally bring together those of differing perspectives to highlight critical issues and provide guidance to policymakers. That said, there are clear limits regarding whom we will allow to use the Institute's podium. Advocates of violence are among those we would refuse to provide a platform. Again, we appreciate your having taken the time to contact us with your concerns. March 31, 2004 update: For my response to this letter and further information, see my weblog entry, "The USIP Responds to My Critique." Aug. 6, 2009 update: When it comes to radical Islam, the USIP keeps stumbling. For the latest problems, see "U.S. Taxpayers Fund Pro-Hamas Propaganda" byt the Investigative Project on Terrorism.